Today I Die is not like our usual Alt+Escape fare. It's extremely short - most of you will probably beat it in ten minutes, if not five - and it's not exactly what some would call "addicting." There's no real replay value; once you've figured out the puzzle there's no incentive to go back and do it again. That doesn't mean it's any less interesting, though. 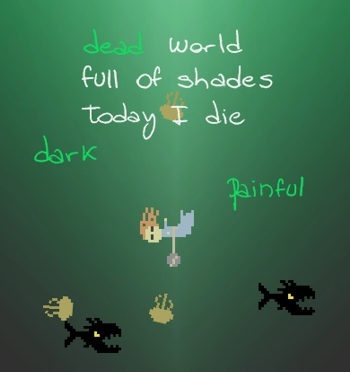 Today I Die exists at the crossroads between browser games and indie art games. It's the brainchild of Daniel Benmergui, creator of other artsy games like I Wish I Were the Moon and Storyteller. To be honest, half the fun in Today I Die is figuring out how to play the thing in the first place, so it's hard to really talk about the "gameplay" such as it is. Even so, the game manages to tell an interesting and compelling story with less than twenty words. It just requires you to think about it for a little bit. Also, it's got a pretty awesome soundtrack (courtesy of Hernan Rozenwasser), which is always a plus.